Watch related video report from VOA's Luis Ramirez. WASHINGTON DC — U.S. President Barack Obama said that American isolationism is not an option, but not every problem has a military solution, during a speech in which he defined his foreign policy approach. In a commencement speech to U.S. Military Academy graduates, Obama said that America will always be a world leader, but military action cannot be the only force behind its leadership. "The military that you have joined is, and always will be, the backbone of that leadership. 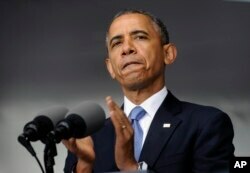 But U.S. military action cannot be the only – or even primary – component of our leadership in every instance," he added. President Barack Obama applauds those who serve in Iraq and Afghanistan as he deliverers the commencement address to the U.S. Military Academy at West Point's Class of 2014, in West Point, N.Y., May 28, 2014. ​"It will be your generation's task to respond to this new world. The question we face, the question each of you will face, is not whether America will lead, but how we will lead," Obama said. Foreign policy experts have increasingly criticized Obama's handling of issues such as the civil war in Syria, the political crisis in Ukraine and the struggle against terrorism, saying the U.S. no longer holds a leadership position in world affairs. In his speech, though, the president attempted to promote U.S. foreign policy as finding a balance between isolationism and interventionism. Obama said some critics say conflicts, such as those in Syria, Ukraine or the Central African Republic, are not for the U.S. to solve. "Not surprisingly, after costly wars and continuing challenges at home, that view is shared by many Americans," he said. The opposite view says "we ignore these conflicts at our own peril; that America’s ... failure to act in the face of Syrian brutality or Russian provocations not only violates our conscience, but invites escalating aggression in the future," he said. "I believe neither view fully speaks to the demands of this moment," Obama said. "It is absolutely true that in the 21st century, American isolationism is not an option." But, Obama said, that doesn't mean that every problem has a military solution. “In such circumstances, we should not go it alone. Instead, we must mobilize allies and partners to take collective action. We must broaden our tools to include diplomacy and development; sanctions and isolation; appeals to international law and – if just, necessary, and effective – multilateral military action,” the president said. Obama cited international sanctions against Russia for its involvement in Ukraine unrest as an example of the effectiveness of multilateral action. “Our ability to shape world opinion helped isolate Russia right away," he said. "Because of American leadership, the world immediately condemned Russian actions. Europe and the G-7 joined us to impose sanctions. NATO reinforced our commitment to Eastern European allies. The IMF is helping to stabilize Ukraine’s economy ... ," Obama added. Rather than launching large-scale military efforts, Obama called for partnering with countries where terrorist networks seek a foothold. That effort includes a new $5 billion fund to help countries fight terrorism and to expand funding for Defense Department intelligence, surveillance, reconnaissance, special operations and other activities. “Indeed, this should be one of the hard-earned lessons of Iraq and Afghanistan, where our military became the strongest advocate for diplomacy and development,” Obama said. “Foreign assistance isn’t an afterthought – something nice to do apart from our national defense. It’s part of what makes us strong,” he added. The speech in West Point, N.Y., came one day after the president put forward a blueprint for ending U.S. military engagement in Afghanistan by the time he leaves office. Republicans in the Senate, most vocally John McCain, Lindsey Graham, Kelly Ayotte, called Obama's decision on Afghanistan a monumental mistake on Tuesday, saying the response was a victory of politics over strategy. “The fact is, the United States is more engaged in more places than it has ever been at any time in history,” Kerry said, citing work in Iran to Syria to South Asia and East Asia. Obama cast the bloody civil war in Syria as more of counterterrorism challenge than a humanitarian crisis. The president defended his decision to keep the U.S. military out of the conflict but said he would seek to increase support for the Syrian opposition, as well as neighboring countries including Jordan, Lebanon, Turkey and Iraq that have faced an influx of refugees and fear the spread of terrorism. "I will work with Congress to ramp up support for those in the Syrian opposition who offer the best alternative to terrorists and a brutal dictator," he said.